Early followers with Father. Rev. Su Won Chung is seated third from right. I was born in Chull San City, in Pyong Buk Province, North Korea. My father, Suk Chun Chung, and my mother, Ae Sun Choi, had two sons and one daughter. I am the eldest son. My grandfather's family was quite wealthy. They believed in Confucianism and had very deep faith. My grandfather's name was Hang Jun Chung. His first wife never bore any children and she later died of an illness. He did have children from concubines, but according to Confucian law, illegitimate children cannot inherit anything from the father. When my grandfather was 45 he married a young woman who was 19. This was my grandmother, Seung Do Kim. She took care of his big family and received a lot of persecution from the concubines and their children, but she overcame the situation by loving them. Her circumstances were difficult because she worked so hard; she eventually became very weak. Even though she started taking a lot of medicine she did not get better. At that time she met a Christian woman named Mrs. Noh who was known to cure illnesses through prayer. After praying with her, my grandmother made a complete recovery. This was her motivation to convert to Christianity despite the fact that it was very difficult to change one's religion at that time. My grandmother believed deeply in Heavenly Father and Jesus and she did not want to attend the Confucian religious services anymore. She prayed every day that she would be blessed with a son. Finally she had a son -- my father, Suk Chun Chung- when she was 33. The boy suddenly became ill. Naturally all her relatives said it had happened because she had changed religions. She asked Mrs. Noh to come again and they prayed together for her son, and he recovered. From that experience she came to believe that Heavenly Father really responds to her prayers. My grandfather persecuted my grandmother a lot because she believed in the Christian religion so strongly. Sometimes he would abuse her and beat her severely. Finally my grandfather decided to separate from her, so he started to build another house for himself. While he was working on it he had an accident cutting wood, and he died at the age of 62. My grandmother was always very eager to attend church. But the pastor of her church was asked to resign because of immoral conduct. This really shocked my grandmother, who began to question many things. She asked herself how a servant of Heavenly Father could act in such a way. She wondered about the nature of sin and began to search for the root of sin. She prayed how to overcome the sin of immorality and she decided to fast. One day while she was deep in prayer, Satan appeared to her. Ridiculing her he said, "Even though you are trying so hard to understand and solve the root of sin, you can never remove my hold on you"
But my grandmother continued to pray to Jesus for the answers. While she was praying, Jesus appeared to her and gave her an answer. He explained to her, "Through the crucifixion, Satan's hold on you can be removed"
When she received this, she was determined to pray even more deeply and seriously to God and Jesus. While she was zealously praying at noon on April 2, 1923, by the lunar calendar, she finally entered the spiritual world. In the spiritual world Jesus came to her and said, "I never met anyone who had such a desire to understand original sin. You may ask me more questions"
So then she asked him, "Did sin come from man eating the fruit of good and evil?" Jesus said, "The fall was the premature sexual relationship between Adam and Eve; therefore, the root of sin is fornication"
My grandmother asked, "Why didn't you explain this 2000 years ago?" In deep grief, Jesus shared this: "I tried very hard to accomplish God's will, but the Jewish people betrayed me and I was crucified. Because of that, we have to comfort God's sorrowful heart. God's first sorrow was that He could not interfere with the fall of Adam and Eve. God's second sorrow was that I came to save mankind but the Jewish people didn't understand me and I was crucified. Please tell all the people about God's and Jesus' sorrowful heart. Jesus told her that his birthday was On January 3, not December 25. He also told her that in his childhood he had been treated like a stepson. Throughout his childhood he had wanted many things but he didn't get anything from his family. So Jesus asked my grandmother to help him remove his resentment, and then they cried a very long time together. My grandmother continued asking Jesus questions. "The Bible says that in Last Days you will come on the clouds. Is this true?" Jesus replied, "I am coming through a physical body." She asked, "Where will you be coming?" "I will be coming to your country of Korea;' he said, "So very soon Korea will become the central nation of the entire world. The Japanese will lose power and be expelled and the Heavenly Kingdom will be established in Korea"
When she heard these heavenly secrets from Jesus, she was completely overjoyed. She pledged to Jesus that she would keep his words in her heart and that she would definitely convey this truth to the world. When she returned from spirit world her face was bright and shining. From then on she was able to see into the spirit world. She was able to cure sick people, examine people's spirits, and perform other miracles. She also explained the meaning of Bible verses. She shared her revelation with her minister, but he didn't believe it and forced her not to tell it to anyone. But that did not deter her because every day of her life was now filled with happiness, peace, and gratitude. Jesus came to her again and urged her to quickly spread the heavenly secrets he had shared with her, even though her minister didn't allow her to. So Seung Do Kim started to share her revelations, and as she spoke out, an incredible heavenly history began to unfold. Many people started coming to her house to receive grace from her. Through fasts and sitting up all night in prayer she testified to the people about Jesus' situation and his sorrowful heart. Because more people were gathering at her house than coming to the church, she was finally banished from her church in 1927. Her house became a meeting place for people from all over Korea. As many as 20 people a day would come to receive blessings from her, to be healed, or to be baptized. They came to receive spiritual guidance and Heavenly Father's care. Because my grandmother and her followers believed that sin was from a lustful relationship, they became vegetarians in order to decrease their carnal desire. They formed a church and called it the Chang Mak Church. As the central figure of the new church, my grandmother Seung Do Kim was called "New Lord." Thank You, Heavenly Father. I thank You that I found new freedom in my life. I thank You that I found new freedom of love. I am happy and so grateful that the Lord is coming to earth. Victory over Satan -- thank You! Glory, glory, glory -- thank You! I thank You for the glory that I will feel forever. Satan's power and authority will leave this earth, and I will only hear the voice of my Lord. As I look up, I see the entrance to a new Garden of Eden. The New Lord has saved my life! Some of the 36 Couples at their Blessing. Rev. Chung is standing third from right. At that time there was a minister in Korea by the name of Rev. Young Do Lee1, who was the leader of another spiritual group that was being persecuted by the Christian churches. He was receiving medical treatment from a spiritual leader named Rev. Nam Joo Paek. He had a revelation that Rev. Paek should find the spiritual group that was working in Eve's position. Rev. Paek eventually discovered my grandmother's church in Chull San. While Rev. Paek was there, he learned from my grandmother that the root of sin was fornication. Second, he learned that Jesus came to build the Kingdom of Heaven on Earth but because the Jewish people denied him, Jesus was crucified. That is the reason my grandmother's church did not put up the cross. The third point he learned was that the Lord of the Second Advent would come to Korea and that Korea would be the central nation of the world. After hearing these revelations, Rev. Paek was overwhelmed. He and his own church members were very happy with the spiritual atmosphere they felt there. A few days later, Rev. Paek returned to his own town of Won San. From there he sent a letter to my grandmother's church asking if some of them could come and help him guide a revival meeting with another spiritual group. My father, my aunt, my uncle, and three members of my grandmother's church went to that group in Won San. But before they could start the revival meeting, the members of the group told them to leave; they could not accept them. So Rev. Paek and the others returned to the Chang Mak Church in Chull San. But one of the members of the group that rejected them came back with Rev. Paek to Chull San. She was the grandmother of True Mother. At my grandmother's church she received a lot of new truth and guided her daughter Soon Ae Hong, Mother's mother. She explained to her daughter, "The New Lord always emphasizes Matthew 5:48, 'You, therefore, must be perfect, as your heavenly Father is perfect.'" She explained to her how mankind must overcome arrogance, jealousy, lust, and anger. They ate only vegetables, no meat, in order to control their fallen nature. My grandmother's group grew bigger and bigger every day. One day the Japanese police came and interrupted their meeting without permission. So Rev. Paek and my father, Suk Chun Chung, registered the group with the Japanese administration and got a church permit. They officially named it the "Holy Lord Church"
Many people came from all over Korea to the church and it grew rapidly. One thousand people from throughout Pyong Ahn Province, Kyung Ki Province, and Hwang Hae Province became members. They eventually set up meeting places in other cities -- Ahn Joo, Sook Chun, Pyongyang, Young Chun, and Sun Chun. At that time all Korean Christians were persecuted by the Japanese who occupied Korea. One day a young member of the Holy Lord Church witnessed to a policeman from the Japanese police department. He told him that Japan would be destroyed and that the second coming of Jesus would be in Korea. He said that many people from all over the world would come to see the Messiah, and that Korea would become a first-class country. The policeman wanted to know more about the Holy Lord Church, so the young member guided him to my grandmother in Chull San. The policeman studied there for ten days and then reported everything to police headquarters. On December 16, 1941, they arrested my father Suk Chun Chung, my grandmother Seung Do Kim, my uncle, and another young man, Young Su Kim. They were in jail for 100 days, during which time the Japanese burned all the records my grandmother wrote of her revelations in the spiritual world. It was a heartbreaking experience. When my grandmother was in jail she became ill. Soon after she was released, on April 1, 1942, she died at the age of 62. She had worked for 30 years building a foundation for a new Christian revolution. In later years our True Parents would say that my grandmother was the first person who understood the root of sin and that she had prepared the growth step for the Messiah to appear. After my grandmother died all the members were confused and had little hope for the future. They scattered, and many left the church. My father became the new master of the church, but he was also sick after being in jail. He had not been united with my grandmother, and the members were not satisfied with his religious guidance. He mainly just helped the members economically. It was difficult for the church members to find transportation to the church headquarters, so they couldn't gather very often. The Japanese police persecuted them more strongly than ever. Therefore, all the members moved to the Pyongyang branch of the church. This remained as the central church until the liberation from Japan. They continued to hold prayer services and to receive strong spiritual guidance. Meanwhile, my father had married and had three children. I was the son of the Holy Lord Church master so many people persecuted me, calling me "Baby of the New Church Master" because we believed the second coming of the Messiah would not be on the clouds but through a woman's womb. On August 15, 1945, Korea was liberated from Japan. At that time the church at Pyongyang gained many new members. But soon after liberation, Korea was divided into North and South. My family escaped to the south because they felt the danger of communism. 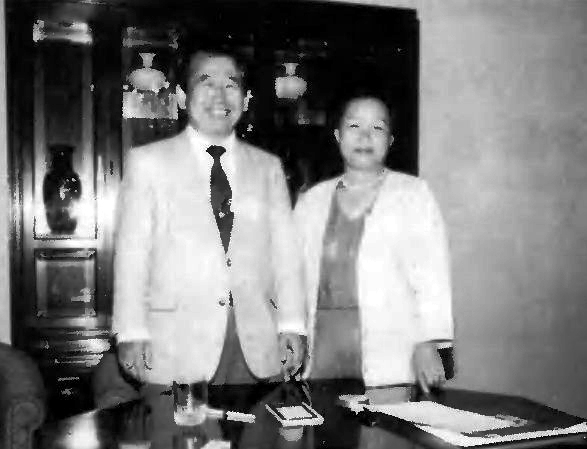 Most of the members stayed behind at the Pyongyang church, and Il Duk Lee and his wife Ho Ho Bin became the new church leaders there, inheriting my grandmother's mission to prepare for the coming Lord. Under my grandmother's guidance, all the members of the Holy Lord Church had learned about the fall of man, Jesus' crucifixion, and the Messiah's coming to Korea as a man. But Mrs. Ho Ho Bin, when she felt her stomach move, thought that it meant the second Jesus would be coming through her own womb, so her members started preparing for the Messiah to come through her. The revelation was symbolic, not literal; but they misunderstood it. They forgot about man's portion of responsibility to understand the complete truth. From that time many people called them the "Inside Belly Church" but they were originally from the Holy Lord Church. The other members of the Holy Lord Church came to South Korea and gathered at my father's and uncle's house in Taegu. My grandmother's last words to us had been, "In the future, if you find any church that is persecuted and accused of immorality, then go to that church. There you will meet the second coming of the Messiah." 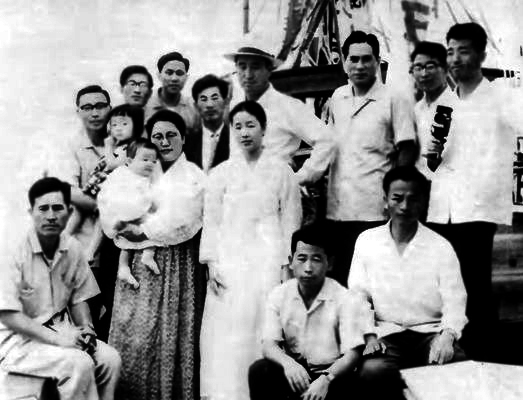 In June 1955 our family saw a newspaper article about many students from Ehwa Women's University being kicked out of school because of their membership in the Unification Church, which was being accused of fostering immorality. So my whole family went one day to the Unification Church and listened to the Principle. We were amazed that the lectures about the fall, the resurrection, and the second coming of the Messiah were exactly the same as my grandmother's teachings at the Holy Lord Church. We assumed that a former member of the Holy Lord Church had discovered the Principle. After listening to the Principle for one week, my father realized that this principle explained much more completely about God's providence than we had ever heard before. Then we learned that the Principle had been discovered by Rev. Sun Myung Moon. After we heard the Principle our family was very happy because the teachings were so similar to what we already knew to be true. So we joined the Unification Church on June 25, 1955. At that time the Unification Church was getting strong persecution. In 1957 we moved to Seoul from Taegu; I had just returned from the army. I entered college and there I studied the Principle more deeply. I had many special experiences with Father at that time. Even though we were suffering from persecution and lack of food we didn't mind, because Father was paying so much attention to us. One day Father took the young church members mountain climbing and he shared rice cakes with us. I remember running and wrestling with Father. I decided to discontinue my studies, and I went to pioneer in Choong Ju. I had a very good experience there. When I was lonely I would climb a mountain to pray and meditate. I wanted to harmonize with the church members, so sometimes we climbed the mountain together and prayed there. I grew to have a deep relationship with the other pioneer members. After the True Parents' Holy Wedding, True Mother's mother, Soon Ae Hong testified to the members that before True Mother was born she had received the revelation, "You will have a baby, but she is not yours; she will belong to God." Then Father testified that my grandmother Seung Do Kim, the Holy Lord Church founder, had been the first person in the providence to prepare for the coming of the bride of the Messiah. At that time my father donated a mine that he owned to the church. In 1960, a 40-day witnessing condition was started, and I went to the city of Jin Chun to witness. The first night I couldn't find any place to sleep, so I spent the night on the bank of a river using a straw bag as a blanket. I fought off the mosquitos all night. I really invested in that condition but I wasn't able to bring any result. However, in the winter we had another 40-day condition, and I was able to witness to 20 people and send them to 20 towns. We made a lot of internal conditions in those days. I went around and visited each town to encourage the young members and the students. While I was working in Ei Rhee I was matched by Father. Father showed me a picture of a sister and asked, "How about her?" I said to him, "She looks nice to me." But Father didn't call me for several days after that, and the other members had already met their partners. Finally Father called me and showed me a different picture. I thought this sister was better than the first one he had shown me. I felt very strongly that Father had given me a good fiancée. We went to my fiancée's house to meet her parents but my in-laws were very opposed to our marriage, especially the aspect of a mass wedding. They said they would consent to the marriage only if it were held at their house. On May 15, 1961, early in the morning, the 33 Couple Blessing was held. Outside of the church building many negative parents were demonstrating. During our 40-day separation period I went to Ei Rhee for a new mission, and my wife traveled around the country as a national IW. My new married life started in separation, but I was nevertheless deeply grateful to our True Parents. On a boating trip with True Parents in the early 60's. Rev. Chung is kneeling in front of Mother. At the end of August 1961 I became the regional leader of Kyung Nam Province. I didn't have any experience as a leader, and when I got there everything was new to me. Every month I gave the local leaders Father's directions, and I had to make sure that everything was done well. I visited every local church by bicycle. One day I had to travel a distance of 100 km, but my bicycle broke down; so I walked and ran the rest of the way. When I finally arrived at my destination at 11 p.m. at night, 20 families were there waiting for me. We had a very deep and meaningful fellowship. Our first regional workshop was very successful, with 50 people attending. Before the workshop two members and I walked from Pusan to jin Hae, a distance of over 40 km, as a condition to finish the workshop successfully. On the first day of 1962, I fasted because there was nothing to eat. We often experienced a severe shortage of food. Once a woman brought us scorched rice so we made rice soup out of it and ate it for breakfast and lunch. This kind of difficult experience was very good for my life of faith. During this time my wife had a son that Father named Jin Woo. I was very happy to become a father. My wife and son came to live at my place, but I felt sorry for the other members, because at that time most members were living separately from their spouses. I hesitated to spend time with my wife and son and always tried to be with the other members. One day after dinner I felt bad being with my wife and son so I went to the prayer room on the second floor. My wife came to the second floor with my son to look for me, so I went to the top of the building, but she followed me up. Almost every day we did this kind of hide-and-seek game to avoid each other, but I was actually much happier than if we had been apart. Also, I could tell that since my wife and baby had come to live with me, the atmosphere of the center had become much happier and brighter. In the summer of 1962 we had another 40-day pioneering period. I sent all the church members out to pioneer in small towns. I visited every town and consistently educated them about True Parents' love and heart. Sometimes I visited four cities in one day. During that condition the local police officers became negative about our activities. Father told us strongly that even if we were persecuted we must go forward. So we tried to be gracious and helpful to every local police officer, and eventually they began to understand. We were happy to give a victorious report about this to Father. Then Father gave me a new mission in Chung Buk Province. It was wintertime and I sent all the members out witnessing. I had to visit them by bicycle, but because of the snow it was very difficult; so sometimes I took trains or even walked. It was very cold outside and we often held our meetings without any heat. On the way to visit one city, Nam Won, I was accompanied by a man named Su Sul Noung, a VOC staff member. During the long walk we both pledged to Father that we would devote our lives to Father and God's providence. 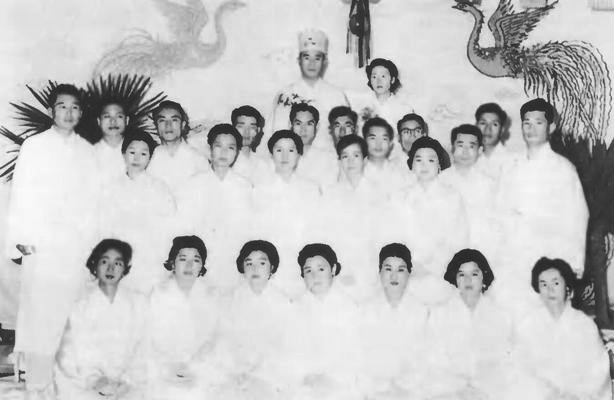 Most of the Nam Won church members were young high school students. The students took turns bringing me lunch whenever I visited, because the church itself had no money. That was the only food I got. The students prepared rice, eggs, and kimchee for me. Their minds were so pure and I cried when I saw their sincerity. They received a lot of persecution from their homes and school but they overcame it with their faith. I often visited Ei Rhee by bicycle. Once on my way back I couldn't stay up on my bicycle. I thought it was not running well, so I checked it, but nothing was wrong. I started up again but the bicycle wouldn't go straight and I knew something had to be wrong! Finally I realized the bicycle wasn't running well because I was so hungry. So the members made me some lunch and we couldn't stop laughing. My wife and I then had a second baby, Kun Sook. The baby was very small and undernourished. She couldn't get enough of her mother's milk, and we couldn't afford to buy any milk. My wife sold household goods door-to-door in order to feed the baby. Many times I thought, "We are the leaders of the restoration of God's will so we have to overcome all difficulties, even the way of the cross. True Father's way was always difficult, and so we as his children have to follow Father's same course in the providence." When my daughter was seven years old her weight was the same as a three-year-olds. When I look at Kun Sook now I feel very sorry. After every regional leaders' meeting at Seoul I would visit Father and he would give me guidance. He taught me, "Even in the most difficult situation, always keep a thankful mind. Every situation can change, Father explained that with such a mind, if we have even some ability and knowledge and if we work hard, we can become winners. So whenever I visited the pioneer centers, I always tried to educate our local family members about Father's will, heart, and thought. In the autumn of 1965, I climbed Gili Mountain with 12 young members. We stayed up there for three nights and four days. We couldn't find any water on the mountain. We had brought rice but we couldn't make the rice without water, so we had nothing to eat. Through these kinds of difficulties our young members became strongly unified. I trained our church members in this way. One day all the regional directors got jeeps. At that time there were not many cars in Korea, so we were very grateful to Father. The church members were also very happy. In July 1966, we had a church leaders' meeting at Mai Mountain. In the evening it was our custom to go outside and read the Principle out loud. This time all the members were asleep, and I had a difficult time waking them up. I ordered them, "Please come out so we can climb the mountain." They finally got up and we climbed to the top of the mountain and sang holy songs and prayed. We ended with a loud "Mansei!" The next day we made a stone tower of 365 stones and called it Tong-il Tower. At this time we started the VOC [Victory Over Communism] movement in Korea. We educated the local people about God's words and communism. We tried to convey to them that only through the Principle can we overcome communism. Every church leader in Korea started working for VOC. In Chun Buk region, 15 church leaders visited every city and we taught all the government leaders the VOC lectures. I was in Chun Buk region for eight years. It was very difficult because everyone persecuted us and I couldn't find a church center. But before I left that region we built a regional headquarters church ourselves. All the members helped to build it. We were happy that finally we could have prayer meetings whenever we wanted. I joined my wife and three children in Chun Chu, and while we were there we were blessed with two more children. I moved to Seoul for a new mission as church director in the Young Dung Po region. We just had a small room on the second floor. It was difficult because we had no members or money, but we just concentrated on witnessing. In December 1970, Father ordered all the blessed wives to go out for three years on a witnessing condition. He told us that we couldn't go to the Kingdom of Heaven if we didn't participate. No one really understood Father's words at that time. When the wives left home they had to give their children to their relatives. The relatives did not understand, but they could not reject the children. The members may have had good relationships with their families before, but during this three-year- period most of their relationships broke down. This was a huge indemnity condition for the members. But it had to be made because Korea was so negative to the Unification Church. It was only after this indemnity condition that Father was able to go to America and build his world- level foundation. My wife participated in the condition, and I became a national IW. Our children had to stay with my assistant, and another sister took care of our new baby Han Sook, who was just 100 days old. This sister was often tired and she would sometimes fall asleep and forget to feed the baby. Many times the spirit world would wake her up and tell her that it was time to give milk to the baby. My neighbors said the house was strange because there were no parents living there, only children. They said God must be protecting that house. In my life of faith I have always had a grateful mind toward Heavenly Father because He protected our family. We didn't really understand Father's direction to separate for three years, but we just followed faithfully, and because of that we were able to bring good results. After the condition was over we wanted to buy a house. We had eight children so it was difficult to find a good one. We brought four children along with us when we went looking and left four at my aunt's house so that the landlords couldn't see how many children we had. We couldn't get a good house so we finally rented an old house on a hill. When it rained the walls were in danger of crumbling and it was dangerous. I always planned that if the house ever collapsed and I had no time to gather our possessions, I would be sure to take Father's picture with me. Once one of my children dreamed that True Mother came to our house, examined it, and proclaimed, "Don't worry -- this house won't fall down." Finally the church provided my family with a house. After my national IW work I became the regional director of Kyung Buk. One day after this Father asked me to be the secretary general of VOC in Korea. I went to Japan with ten Korean congressmen. Korean congressmen generally didn't like our church activities, but after they visited the Japanese Unification Church center they were very impressed and became positive toward us. Many people persecuted the VOC movement because it was sponsored by the Unification Church. We continued to give VOC education nevertheless. In 1973 the Korean government gave us permission to build a VOC educational center. From that time we educated all the major government leaders and other officials. In September 1974 Father gave me a blessing in the form of a trip around the world. I first went to the Madison Square Garden Rally. During the eight-city tour, even though Father was very busy, he took our group of leaders shopping and sightseeing at Disneyland, Niagara Falls, Las Vegas, and Chicago. We could feel how vast the country of America was, and we realized how proud and arrogant the American people were. They were always boasting that they had the biggest building, the largest lake, etc. Therefore, we could feel True Father's heart in trying to save America. We also visited twenty different countries, including England, Scotland, Germany, France, and Italy, and then I returned home to Korea. After working two years as secretary general of VOC, I became president of the Il Hwa sales company. This was my first time working in a business. Everything was very new for me. I pioneered the sales market nationwide. Our company took over the market in the country and became the highest in sales. After that I became the director of witnessing at the national church headquarters. Twice I visited all the churches in Korea, checking up on all their activities. I asked myself, "If we have the Principle, why is our church not improving?" I discovered that most of our church leaders had a lack of understanding of Father's heart. The leaders didn't take care of members with God's love. They were in Abel position, but they just gave direction to the members without much heart. Consequently, the members didn't have good relationships with their leaders. So when I visited the churches I emphasized to the leaders, "You should cultivate the heart of parents and be servants to the members." On November 1, 1976, my father, Suk Chun Chung, who had been the master of the Holy Lord Church, died. He had been paralyzed on one side of his body for ten years. True Father had told us that since he had not been completely united with his mother, Seung Do Kim, and had not inherited her tradition, he became paralyzed for indemnity reasons. From this experience I learned that we have to pay indemnity if we don't fulfill our portion of responsibility. In 1981, couples up to the 430 Blessing were asked to give up everything and go pioneering. I was the director of the church headquarters in Seoul at that time but I too went out pioneering. It was rumored that I went pioneering because I had done something wrong and was being kicked out, but all I was doing was following Father's direction. I didn't complain and I tried to overcome any difficulties. My wife and I prayed together each day and read the Bible and the Principle. We were able to establish a small church, and in one year, 12 people joined. Soon we increased to 30 families. Coming to America was a unique experience for the Korean leaders; we felt it was a new way of pioneering. I became a regional director and began to counsel family members about their spiritual situations. I concentrated on connecting our family to True Parents' heart. I saw that our family was not very harmonious because the leaders at that time were more focused on their individual responsibilities. So I tried to unite the department leaders together. Most of them weren't connected heartistically to Father, so they didn't understand Father's words very well. Whenever they gave sermons it was their own ideas they conveyed, not Father's. Therefore, wherever I went I emphasized that we have to understand the Principle exactly. In front of family members I never said, "I am a 36 Blessed Couple. I am in Abel position" I tried to convey the feeling that we were all one family and that I wanted to make good relationships with my brothers and sisters. I told them if we lived this way we could feel closer to each other. I have been educating members to realize that, no matter what the situation, we have to follow and obey Father's direction. Whatever direction Father gives, the Korean and Japanese leaders usually follow without question. American leaders and members usually do not follow unless they understand why. Americans are generally more pragmatic and logical in their thinking, so it is difficult for them to accept Father's direction on faith. Father's direction is sometimes beyond logic. Usually in my sermons I try to express the heart and will of a true parent, because so many members did not receive true love from their parents. Even though they may not understand my sermons, I still try every day to convey something about the heart of True Parents. I want to do that because for 30 years I personally experienced that the True Parents always want to give unconditionally to the members -- materially, heartistically, and through their words. I know what my difficult point is: I speak too harshly. I can't talk in a soft and friendly way. This is my weakest point, and my wife is always mentioning this to me. I sometimes give people a cold feeling from my attitude. Somebody reported to Father that I was like that. Father then spoke to me and said, "After you speak strongly to the members you must embrace them." When he said that I felt so ashamed. I have always emphasized to members our course of indemnity and restoration. Everyone should go the way of a pioneer. It is easy to say thank you to others when you feel good, but in our church we have to go forward with a grateful mind even if we don't feel good. That is our way of restoration. Father always explained that we have to have faith three times greater than Peter's, wisdom three times greater than King Solomon's, and love three times greater than Jesus'. That is True Father's motto of faith. Father said if we believe and act with 100% faith, we will achieve 100% success. If we believe and act with 50% faith, our success will be only 50%. We have all experienced this kind of thing, but we usually do not seriously consider what Father means by these words. We cannot progress if we follow our own lifestyle -- we have to follow Father's way. If we don't make an effort to do this, Heavenly Father can't give us anything. We have to fulfill our own responsibility so that we can receive Heavenly Father's blessing. In three years I have been the regional director of five regions. Whenever I go to a new region I fast for three days. And I always tell the members, "Please read five pages from The Divine Principle every day out loud. Please read The Divine Principle book or listen to the tapes 50 times" If we read five pages a day then we will be able to feel, "True Parents gave these precious words to me and I want to share them with other people" I have already read The Divine Principle 12 times since I came to America. If we do this every day in our life of faith, we will never be tired and we will always be growing. Through reading the Principle we will find Father's heart and discover Father's will. When we read the Principle it is like the voice of prayer. If we read it to our children when they are sleeping their spirits can grow and evil spirits will not invade. Father always considers the Principle more important than life, so we must study it very hard. I recommend following Father's direction of 1-1-1. Many people forget his direction to bring one person every month. We should bring 12 people in one year and pray for them. I recommend writing once a month to your parents and relatives. Even if husbands and wives are separated they should write each other no less than once a month. They should share their experiences so they can understand each other's heart and personality. In 1985 when we started the 2-day CAUSA seminars I experienced miracles. We had CAUSA seminars in the Chicago region twice every week, and we have since educated 4000 ministers. This blessing came because we followed Father's direction absolutely and with faith. If we try to follow and do our best, then Father can help. Unified in prayer, our city leaders and family members fulfilled their responsibility. Every result comes from Father's love and our brothers' and sisters' prayer. Our unified prayer was accepted by the spirit world and the spirit world assisted us. I am happy to work in America and I am grateful to Father, for I have had an unforgettable experience here. Again I pray for the American Unification Church and every member. I pray that we can march together for the final victory. 1. Rev. Lee had received similar revelations concerning the coming Lord as Seung Do Kim had, and his church was in the Adam's position among the spiritual groups in Korea prepared to receive Father at that time. For more insight into the situation among these groups.